Photo trends change every year. The lists come out across all industries about what’s hot for the year ahead. Photography is no different. Right now, Kodak is the hottest property in the smartphone market but will this impact the serious photographer? Regardless, it is great to see a much-loved brand finding a contemporary platform to reinvent itself on. Strong women. Along with increasing coverage in sectors like sport, the woman role model is being focused on like never before. Despite Hilary not making it to the top job, the desire by media and public opinion to see the female of the species represented positively is apparent. For your business, this might translate into a novel way of doing the family portrait or how you cover the local school’s characters. Real imagery. Fake news and enhanced photography hit its peak in 2016. Now the will to see authentic stories and candid images is strong. This is confirmed by the trend to see very real and natural photography for use in mainstream campaigns. Your business offering may look at ways to provide authentic portraits and formats to present products in this light. 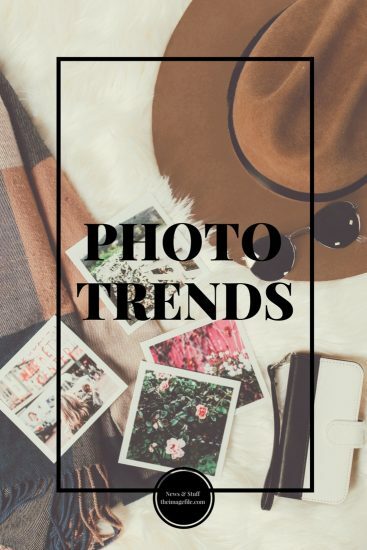 Photo trends, much like fashion, can be misleading. It’s because all things seem to be reinvented and reused at some point. One of the keys is to listen and observe patterns in behaviour at the events and weddings you cover. See how people are acting in their posing and also discussing their photos. What people want to see, and then that ideal taken to a new level by a professional is a great way to deliver a solid product that people want. It is also useful to look back at recent years, what the trends were and see which ones became successful. These styles will perpetuate. Being in a position to use a selection of styles when discussing someone’s event, portrait or wedding will give you more opportunities to win that business. It is reassuring to the potential customer to see the mastery of several styles. In general, our interaction with social media and technology will be the thing that drives the development of these photo trends. As a result, it is very likely that the following will remain true as they have proved in recent times. The impact of film. It is predicted in 2017 that nearly three-quarters of all traffic on the internet will be film content. That’s phenomenal but given our daily habits perhaps not that surprising. How this impacts your business is up for debate. Traditional techniques of still photography and time-honoured traditions are very much the norm. Mastering film techniques will obviously not hurt though! Sharing content quickly. During and after events like weddings, the most common activity is being able to share and de-brief on the day and night before. Being able to take advantage of this habit in your service in an innovative way could be a real selling point.